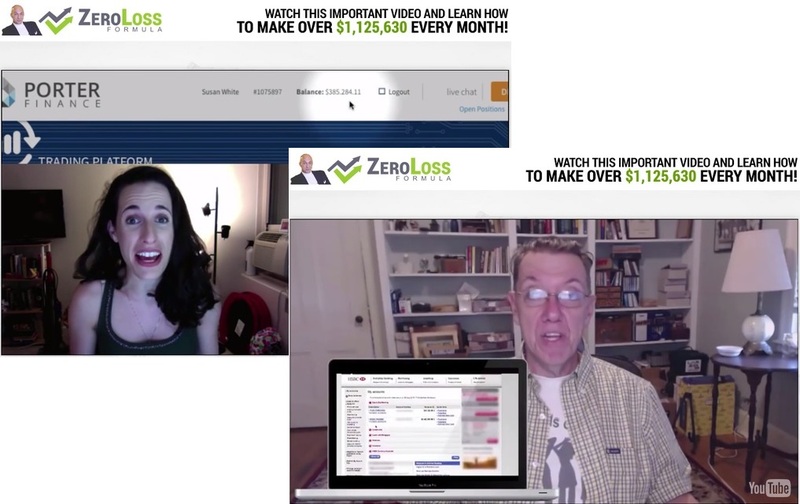 Zero Loss Formula Review - Lost $250 With the Scam! 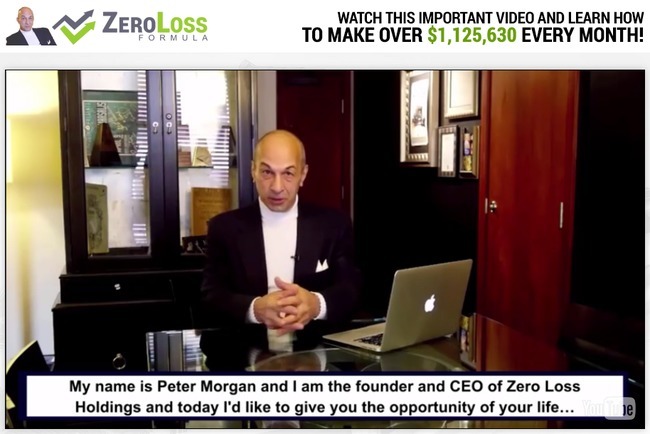 Zero Loss Formula by Peter Morgan advertises itself as the only binary trading software that guarantees your profits. However, 2 of our readers have already reported losing $250 each within a day. Don’t sign up for it, because Zero Loss Formula is a scam out to get your money. Read this review as we uncover the tricks and lies used by the scam to make money off its victims. Online scams often use ridiculous earnings to get the attention of its victims, and the claim of making over $1,125,630 every month with Zero Loss Formula software (see screenshot above) puts it right in the suspicious list. Apart from showing the lavish lifestyle of Peter Morgan, the sales video promises to make you guaranteed profits for FREE simply by using their software. The only return they want is a profits statement of your trading account 6 months down the road, which is minimal effort IF the software works. Time and time again, these online scams make it sound extremely easy to make millions of dollars from the internet. People who wish to get rich quick simply ignore the red flags and pay for these “opportunities” without doing proper research, and this is exactly how the scammers profit off the ill-informed victims. The truth is, making money online requires as much effort as anything else. There’s simply no push-button profit machines on the internet. Now let’s look at some evidence as we prove that Zero Loss Formula is a scam. Within the sales video of Zero Loss Formula, we can see several testimonials recorded by their members. Both of these members claim to have made huge profits using the software, and their financial lifestyles have changed thanks to Peter Morgan. This kind of social approval has a powerful impact on the potential victims. Most victims sign up because they are convinced by the success of other members. Unfortunately, in this case, these member testimonials are fabricated and designed to fool their victims. 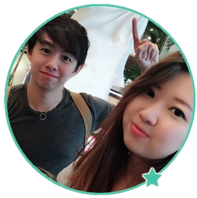 Take a look at the Fiverr profiles below. We managed to discover the Fiverr profiles of the actors who recorded fake member testimonials for the scam. You can find the Fiverr profiles of these 2 actors here – Jaimbalaya and Benjoman15. Fiverr is a freelance marketplace that provide all kinds of services, and this includes reading the scripts by clients like a real testimonial. There are hundreds of people on the platform selling similar services for similar prices. Since the scripts are provided by the clients, these testimonials are mostly fabricated. We do not condone or condemn the act of buying and selling fake testimonials, but we want our readers to be aware of this – that fake testimonials can easily be bought online. Don’t sign up for Zero Loss Formula just because you are convinced by the video testimonials of these fake members. According to Peter, Zero Loss Formula software makes market prediction using financial news around the world. The problem is, the software makes dozens of micro-trades a day, with each of these trades lasting just a few minutes. These micro-transactions don’t reflect the general direction of the market – they are just random movements, because the trading time-frame is too short. 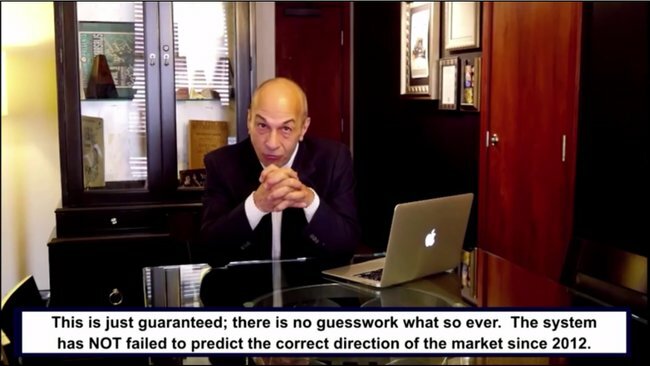 Even though Peter claims that his software has not failed to predict the correct direction of the market since 2012, we discovered that Zero Loss Formula did not even exist before July 2016. To determine if Zero Loss Formula has been around since 2012, we consulted the whois information for zerolossformula.com. It contains all the important information about a website, including the creation date of the site (see screenshot). Turns out the website was created only in 2nd July 2016, a month before this review was written. There’s no way the software has been around since 2012. Keep in mind that Zero Loss Formula software can only be obtained through the website itself, as it is tied to the broker account assigned to you through their sign-up form in the website. The claim of winning all trades since 2012 is just another lie by Peter Morgan to instill confidence in the scam, and to lure more victims into signing up. As much as Peter Morgan and Zero Loss Formula want to keep you in the dark, they have to reveal the true nature of the scam somewhere in the website to prevent legal actions. They chose to hide the truth deep within the disclaimer document, in which you can’t find anywhere within the sales material. The only way to access the document is to scroll to the bottom of the page and look for an extremely small fine-print that that reads ‘disclaimer’. Even if you manage to locate it, you have to read through the wall of text to find out the truth. You can read the original disclaimer at their site at this link: zerolossformula.com/terms. Despite promising you guaranteed profits, it’s your own fault if you use Zero Loss Formula and lose all your money. NO trades have been executed using Zero Loss Formula automated system. All results shown are simulated. There were no real trades generated using Zero Loss Formula software, and all the profits shown in the sales material are nothing more than fake statements. If Peter wanted to be upfront about the risks and the fact that no actual trading has been done with the software, he would’ve told you in the sales material. YES, ZERO LOSS FORMULA IS A SCAM. We strongly advise you to stay away from the scam if you don’t want to lose your hard-earned money. Thank god I found this review! I was so close to signing up!